It’s never been easier to build a fully-functional eCommerce website. Turnkey solutions abound — and many of them are excellent. 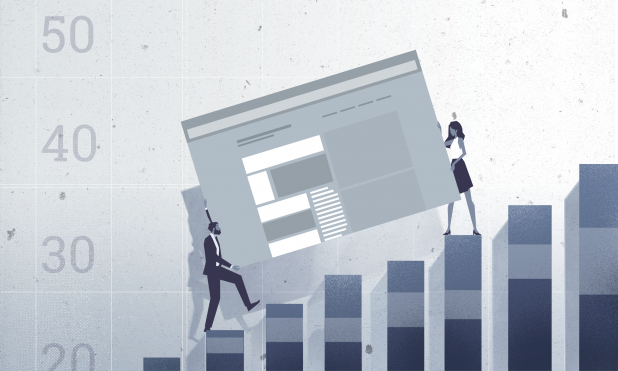 If you’re already running a successful eCommerce store, or just getting ready to take the plunge, these five tips will help improve the value of your website and grow your bottom line. One of the most crucial decisions any eCommerce owner can make is the platform they use to build their eCommerce store. There are many options out there. Shopify is one of the most popular – it’s easy to get a good-looking, functional store up and running quickly. With Shopify Payments, you can avoid much of the hassle of setting up a third-party payment gateway and be sure that your customer data is secure. Fulfillment by Amazon (FBA) is another successful platform that’s worth a look. You lose some freedom in terms of being able to brand and design your shop, but you gain access to Amazon’s best in class supply-chain-management and customer service. You don’t need to worry about warehousing, shipping orders to customers or dealing with customer returns. FBA handles all of that for you. This should free you up to create content to drive traffic to your site and research what new products to offer. Gone are the days of stuffing your site with keywords and expecting Google, and your customers, to find you. Google has gotten much better at identifying real, high-quality content and rewarding sites that create it with higher search-result rankings. Content—everything from your store’s blog to its social media strategy—will be the No. 1 driver of organic traffic to your site. Content must be the cornerstone of your search engine optimization (SEO) strategy. Keep your e-mails relevant and to-the-point: Consumers spend an average of only 11.1 seconds reading an e-mail. If you don’t grab their attention and hold it, they will move on to the next mail in their inbox. Segment and Personalize: Studies show that emails with the customer’s given name in the subject line get opened 29 percent more often than those without. Don’t stop there. Use signup forms and follow-up e-mails to gather valuable customer feedback regarding their newsletter preferences, occupation, gender etc. This info will allow you to segment and target your e-mail campaigns more effectively. Most eCommerce store owners will at least be familiar with the concept of keyword advertising, wherein advertisers come up with search terms that your target customer might type into Google. Typically, keyword advertising is used to highlight your business as the solution to a customer’s problem or needs. If you owned a scuba diving shop in Minneapolis, for example, a keyword you might want to research could be “scuba equipment Midwest.” Using Google’s Keyword Planner tool, you can see how well relevant keywords are performing. Even more importantly, it will give you ideas on similar keywords, show you the search volume, and the cost-per-click (CPC). As you can see from the screenshot above, “scuba equipment Midwest” has no search volume. 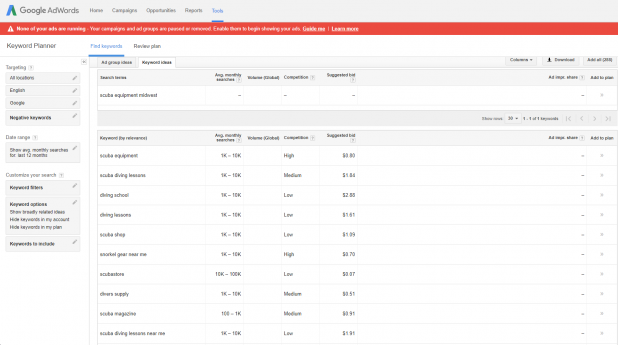 The Keyword Planner suggests similar phrases and shows you the average number of monthly searches, competition for the keyword, and the suggested bid price per click. Another tool I wholeheartedly recommend is SEMrush. It allows you to go even further in-depth with keyword analytics by granting you the ability to see what keywords are driving traffic to your competitors. Record-keeping is by far the most-often overlooked factor in building a valuable website. It may not be exciting, but it is vital to both your eCommerce store’s eventual valuation and its day-to-day viability. There’s no longer any excuse for not keeping accurate financial records from day one. Quickbooks makes it easy for you to provide detailed reports at the click of a button. Quickbooks syncs with most bank accounts, making the debit side of the ledger a breeze. Make sure to track income carefully as well by making your input as granular as possible. The more accurate the data on your debits and credits, the easier it is for a potential buyer to evaluate how much your business is worth. Accounting records aren’t the only thing you need to document. eCommerce businesses should absolutely set up Google Analytics to discover and track where organic traffic is coming from. Having verifiable data on traffic will greatly enhance the value of your business. If you follow these five steps as early on in your eCommerce store’s life-cycle as possible, you will greatly boost the value of your business. Not only will ROI of your efforts grow, but when your site becomes successful, you should be able to find an interested buyer to purchase it. You’ll then be free to move on to the next challenge, with significantly more cash in your pocket than before you started. > Thomas Smale is a serial online business entrepreneur and expert. Early in his career, he began building and selling small online companies. This turned into one of his ventures when he founded FE International(FE) in 2010, growing the business with zero funds from ground up and consistently doubling annual revenue, as well as the average deal size. FE has several subsidiaries, including MageMail, MRR Media, and GrooveJar. Thomas specializes in advising in the M&A of SaaS, e-commerce, affiliate, and content businesses. He has consulted thousands of internet entrepreneurs on exit strategy, growth, and business development.